We saved the description of our Show Home for last because we absolutely love it here. This home is the Grand Central Station of Fawdry homes, it is where we conduct the management of our projects and it is where we make our first impression and presentation to our clients. The Rocky Point Show Home is a Silver finalist in the following two categories ~ Excellence in Single Family Detached Home ($1,000,000-$1,500,000) & Excellence in Show Home ($500,000 & over). Here are the details but please come and see for yourself. Located in the heart of a well-established master-planned community with strict architectural guidelines, this show home pushes boundaries. Buyers experience a cutting-edge design that speaks to their desire for sophisticated features, intelligent open-concept floor plans, and seamless indoor/outdoor integration. Industrial-chic accessories and furnishings throughout resonate with buyers who love entertaining, cooking, and the local Okanagan winery scene. It is an amazing home for those that value comfort, quality and luxury. The Great-room’s focal point is a dramatic, one-of-a-kind feature-wall with a double-sided gas fireplace and hand-crafted Art Deco concrete polymer surround (six-layered material). Matching Tiffany chandeliers add charm and bring in a sweetness and warmth. The kitchen’s grey-on-grey brick back splash is an actual match to the brick detail on front of house exterior. Built-in wine fridge and 36-bottle display wall with prep-sink below celebrate Okanagan wine-country. Cabinetry is sleek and so unobtrusive it is almost as though the kitchen is only there if you need it. For those food lovers and entertainers – rest assured the kitchen is indeed there when you do need it featuring top-of-the-line Wolf/Bosch appliances, custom hood-fan (welded on-site), abundant storage and counter-space maximize functionality in compact space. Office on main /adjacent to great-room features a playful “vintage bicycle wall” and heavy-timber desk with custom steel supports: fun, funky, definitely unexpected. Powder-room’s sink made from genuine Bordeaux wine-barrel: antique,and an iron faucet hand-crafted at Sonoma Forge (California). The staircase leads to an open loft style upper floor / master suite. The custom high-impact steel rises/stringers, incorporates low-maintenance, white-oak treads, and unfinished steel-tube railings that will acquire patina over time. The custom fabricated steel tube railing with its glass panels is a unique variation of the now popular glass railing. Upper-floor, master-suite spans entire northern perimeter wall. Curb-less shower features arched European shower head (only second one in Okanagan): functional necessity becomes art. His’n’hers vanities and walk-in closets (with gold & black chandelier to match bedside pendants) plus deck access complete this private, adult retreat. Backyard’s natural-rock outcroppings complement home’s mountaintop location overlooking desert valley. Artificial-turf putting-green provides fun-at-home for outdoor enthusiasts. Bonus: no watering required. 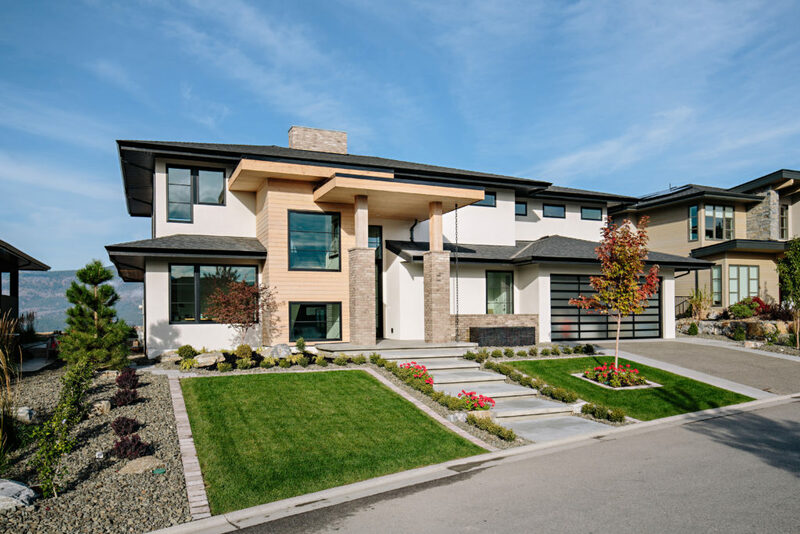 This home features ~ ICF foundation, geothermal heating/cooling, reverse-osmosis water filtration, and dedicated HRV system just four of many standard features meeting eco-savvy buyers’ desire to minimize environmental footprint. Automated home lighting system and 4 kilowatt photo-voltaic solar panels also included. The lower-level of this home is where we work with you on building your dream home and is staged as an office but has been pre-planned for easy conversion to workshop/gym/theatre room or an in-law suite with private entry. Thank you to all of our suppliers, sub contractors and designer Shonna Fox – we will be featuring all of the supportive team players that bring together these homes in the weeks to follow. Nothing gets accomplished without Team. Results of Tommie awards will be announced at a Gala on January 19, 2019. Stay tuned for results and come check out this home for yourself at 1462 Rocky Point Drive in Wilden.